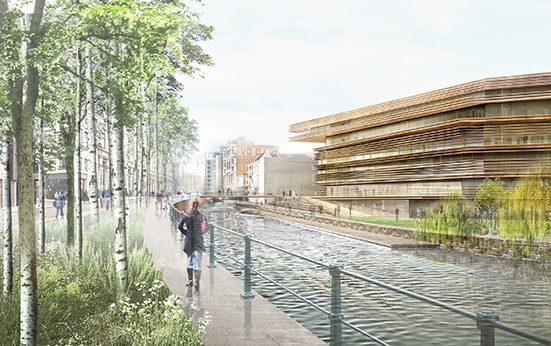 Belgian architects Coussée & Goris design "The Library of the Future"
Belgian architects Coussée & Goris teamed up with their Spanish colleagues RCR Aranda Pigem Vilalta to win the design competition for a library in Ghent, Belgium. When 3D renderings and plans were presented last month, Belgian journalists quickly nicknamed the new building "The Library of the Future" and gave it some rave reviews, stating it will discreetly fit in the mid 19th century neighborhood--which had slowly deteriorated the past decades--and give it a powerful boost. The architects opted for a spacious design with lots of windows. Since there are no tall buildings in the center of Ghent--with the exception of a few Gothic churches--Coussée & Goris designed a low building with only five floors. On the top floor there are offices for the staff, and the other levels are reserved for a cultural library, a technology library, and a new media center. The youth library and a large reading room are situated on the first floor. An open square surrounded by restaurants and fraternity houses invite people into this warm establishment. The jury states that the new concept “finds the right balance between the city noise and silence, between concentration and relaxation, between dynamics and seriousness.” In this new "Library of the Future" knowledge, new media, city planning, architecture and people come together. Congratulations to Vectorworks firm Coussée & Goris for designing our future! To read the news in Dutch, please visit Design Express' website.